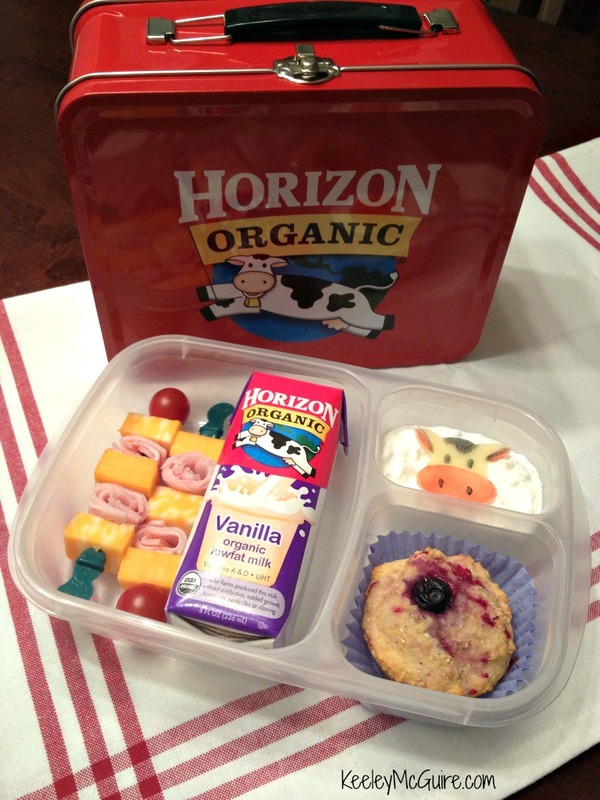 Gluten Free & Allergy Friendly: Lunch Made Easy: Horizon Organic Dairy Lunchbox Fun! 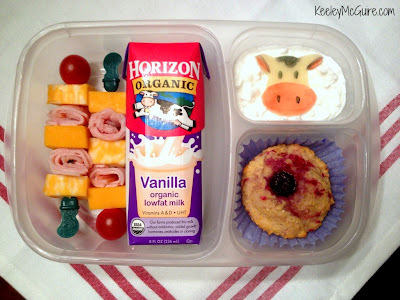 Lunch Made Easy: Horizon Organic Dairy Lunchbox Fun! About a week ago, Little Miss received a care-package from the amazing folks at Horizon Organic Dairy. Little Miss happens to *love* Horizon dairy products, especially their cottage cheese and milk boxes. What better way to show off her favorites, then with a deliciously packed lunch! Little Miss has two skewers of cheese, turkey slice roll-ups, and tomatoes. The skewers are actually recycled Starbucks coffee sticks (thanks for this awesome recycle tip MOMables). Beside her meat and cheese sticks is her Horizon Organic Vanilla Milk box. In the upper right she has Horizon Organic low-fat cottage cheese. On top is the Horizon cow made from cheese and decorated with food safe markers. Bottom right is a Very Berry Cornmeal Muffin - I got this recipe from the Horizon web page. I made ours gluten-free, of course, and used raspberries & blueberries in our muffins. Yum! Lunch is packed in an EasyLunchboxes container. Omg....that cow is freaking AWESOME!